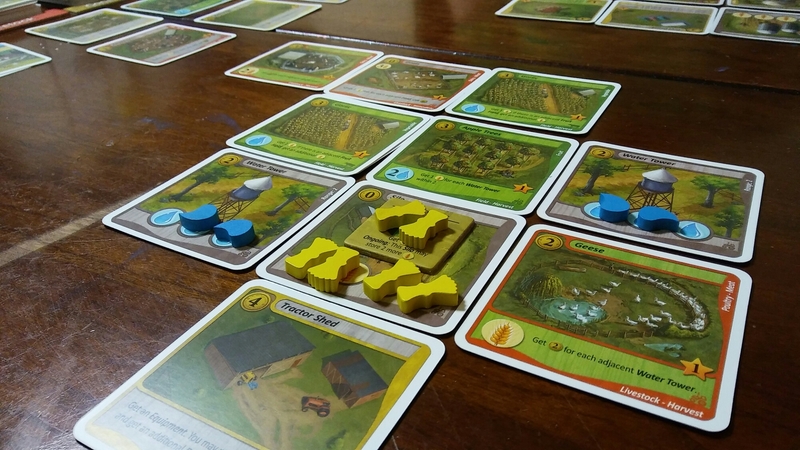 Fields of Green allows players to take on the role of a modern farmer. Each player will draft cards in order to build their farm with harmony! 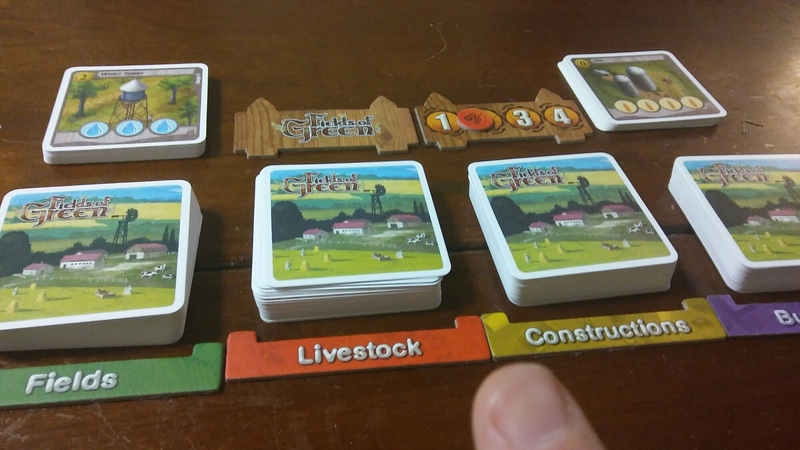 Through out the game you will find cards that represent livestock, crops, construction and buildings in order to make the most of your available land. Make sure you locate your water towers close by your crops to keep them irrigated and you have enough grain to feed your livestock or things will go badly. Who has what it takes to be the best farmer in Fields of Green? At the beginning of the game each player will start with one full Water Tower and a Silo, with only one grain on it. You will also get 15 coins to start. That is it, you are now ready to start playing. You will play four rounds. Each round consists of different phases including a Upkeep Phase, Action Phase and Harvest Phase. The first Phase is the Upkeep Phase. The first thing you do during the Upkeep Phase is reveal an Event. These Events will have an effect triggered on the current round. You then get new resources for the round. Next, there are 4 different decks of cards. During the Upkeep Phase you draw six cards from those decks. The only rule is you have to take from at least 3 of those decks, but you can take as many cards from one deck as you want. The Field deck and cards focus on planting crops giving you more. The Livestock helps you get more money. Constructions allow you to do special actions that help with other things on your farm. Buildings cards focus on end game points. The first person will draw their 6 cards then the person on the left until everyone has got six cards. From there, you are now in the Action Phase. During the Action Phase you take one card from your had and do an action with it. Everyone will do this simultaneously. The actions are, Buy the card and put it on your farm. Or discard the card. Once you discard it, there are a number of things you can do. You can go to the market and get coins, build a water tower or silo, or turn over a Bare Field. To place it on your farm, you simply pay the cost and put it next to a card already in your farm. Once you have completed your action, you pass your remaining cards to the person on your left and choose another card for an action. You do this until there are no cards left. The last phase is the Harvest Phase. Many of the cards you choose to add to your farm will have a harvest ability, or upkeep cost. During the Harvest Phase you need to supply your fields with water and your livestock with food. The food can travel anywhere on the farm but the water is a little more difficult. The water can only travel 2 cards away from the water tower. This is really important to where you put many of your fields. For every card you cannot fulfill during the harvest it will be turned over and won’t be scored at the end of the game. Some of the cards also give you equipment tiles that you can use during the game for special actions. Some might allow you to refill one of your Water Towers or pump Water three cards away instead of two. Once you use your equipment, it usually is removed from the game. You continue doing this for four rounds and then points are tallied. 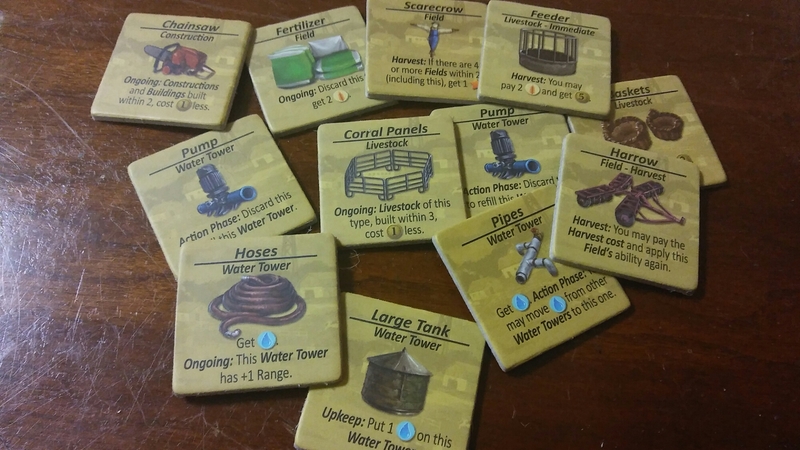 You receive points for the cards that are face up in your farm, points from you Building Cards in your farm, one point for every Water Tower that has no water on it, one point for every 2 Food in your silos and one point for every 3 coins. The person with the most points in the greatest farmer of the 20th century! The components for Fields of Green are solid but not flashy. The cards are really good quality and the art on them is fantastic. It really puts you in the feel of having a farm. One side of your farm is dedicated for livestock while the other side is for fields with a mix of buildings, with Water Towers and Silos scattered around. It comes with good cardboard and wood components. I will say that the insert was pointless due to the fact that it got shredded during shipping. This is something Artipia Games needs to address as this is now the second Kickstarter game that has been damaged from them. Over all I am very happy with the components. There are some solid Mechanisms in Fields of Green, though they may not be revolutionary, they work really well together. If you have played Among the Stars, nothing is going to knock you off your seat, but I do prefer Fields of Green. The best mechanism is the Water Towers associated with the Harvest Phase. Making sure that the fields you need during Harvest for their actions are close enough to a Water Tower so you can take advantage of them is a really fun little puzzle and makes your planning and decisions during the draft even more meaningful. You also need to make sure you have silos for your grain and enough grain for your animals. It is just really fun. I also like the different drafting when playing with 2 players and 3-4 players. In a two player game, you reveal six cards and each take a turn drafting a card from the six face up. You continue to do this until all are drafted. In the 3-4 player game, you do a normal draft where you have a hand, take a card, and pass the rest to the next player. It really is a different strategy with a 2 player game where you can kinda plan in advance, unlike the 3-4 player game when you don’t know what cards are coming. I also like the mechanism where the players draw cards from 4 different decks of cards. If you pay attention to what others draw you can draw your cards based on that. If the player before you picks a lot of fields, you know you will be getting a good choice of fields on your second turn, so you might not pick very many fields. It adds a good little added decision. Replayablility is above average. There are many different things to focus on. Many times this will be dependent on what Buildings you get and what points they will give you at the end of the game. It’s important to get those buildings but when you get them is the key. There are plenty of different types of fields and livestock that all have different abilities and actions on them. Each time you play you will probably be doing the same thing, getting a little of everything to be a well oiled farm but the cards will be different each time. I really enjoy the strategy in this game. It is for the most part a solitaire game with very little interaction with the other players but that doesn’t mean there is no strategy. 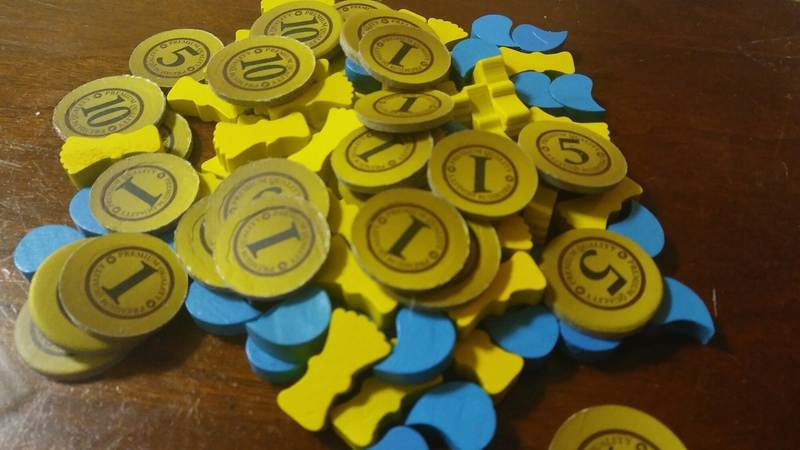 There is a bit of randomness when it comes to the card draw and equipment tiles, but that is mitigated by being able to use each card for different actions. There is some great strategy involved with choosing which card piles to draw from, which cards to use on your farm and which ones to discard for other actions, making sure you have the right amount of water, grain and money for the Harvest Phase and when to build your buildings for an optimal strategy for end game points. I really love the choices and thinking that is involved with the strategy of Fields of Green. As I mentioned before, Fields of Green and Among the Stars, also by Artipia Games and Vangelis Bagiartakis, are almost the same identical game with basically the same mechanics. I do like Fields of Green more, mainly because of the theme. I also love the Harvest Phase and the puzzliness about it. I can understand the concept of building a farm more than building a space station. I am very pleased with Fields of Green. 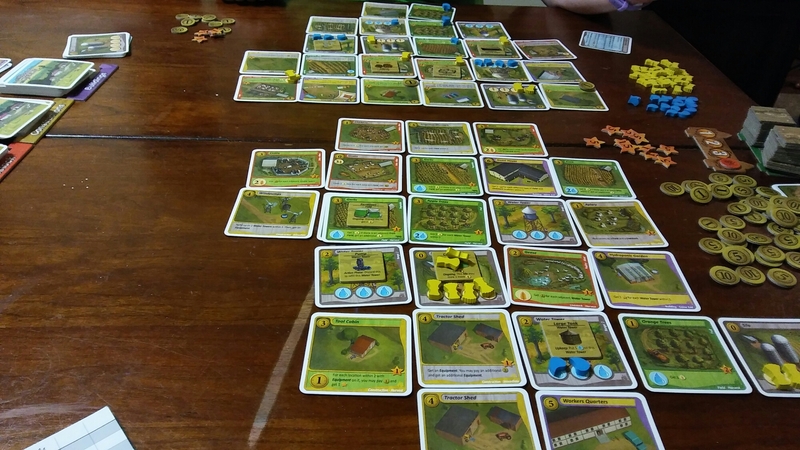 When I finish the game and look out at my sprawling farm (this game is a MAJOR table hog) I love to see the progress and evolution that my farm took through out the game. It really feels like a farm that I took from a small humble beginning to this massive productive juggernaut. If you like farming theme…get this game! If you like light games with good decisions….get this game! If you like puzzles in games…get this game! It’s a solid, solid introductory game into the hobby!